In ten years, between 1915 and 1925, the United States went from having one named highway to having an unorganized and confusing system of named highways. They were primarily marked by painted colored bands on telephone poles. Sometimes, where several named highways shared a route, almost an entire pole would be striped in various colors. It was time for an organized national system of highways to be formed. A system of numbered highways. The Lincoln Highway Association was all for a numbered highway system, as long as one number corresponded to the Lincoln Highway and the names stayed with the roads. It didn't want to see its highway chopped up into little numbered bits. In March 1925, the American Association of State Highway Officials (AASHO) started planning a federal highway system. All named roads were ignored in their planning. That November, the secretary of agriculture approved AASHO's plan, which set up the now-familiar U.S. highway system. Major east-west routes would be numbered in multiples of ten, from U.S. 10 across the north to U.S. 90 across the south. Major north-south routes would end in 1 or 5, from U.S. 1 between Maine and Florida to U.S. 101 between Washington and California. The Lincoln Highway was broken up into U.S. 1, U.S. 30 (including U.S. 30N and U.S. 30S), U.S. 530, U.S. 40, and U.S. 50. Nearly two-thirds of the Lincoln's length was designated U.S. 30, which began in Atlantic City, New Jersey and ended in Astoria, Oregon. The AASHO also adopted a standard set of road signs and markers, and to avoid confusion, all markers of all named roads would have to be taken down. Interest in the Lincoln Highway dropped considerably. The association ceased activity at the end of 1927. Its last major activity was to mark the highway not as a route from one destination to another, but as a memorial to Abraham Lincoln. On September 1, 1928, thousands of Boy Scouts fanned out along the highway. 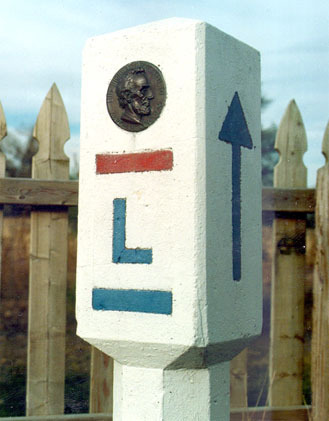 At an average of about one per mile, they installed small concrete markers with a small bust of Lincoln and the inscription, "This highway dedicated to Abraham Lincoln." While the other named highways were quickly forgotten, the Lincoln Highway was not. A whole generation of Americans, exposed to the well-organized publicity of the Lincoln Highway Association, kept the Lincoln Highway alive long after its official significance was gone. It was the backdrop for an NBC radio show on Saturday mornings. Airing for two seasons in the 1940s, it had an audience of 8 million listeners. By the late 1940s, the Lincoln Highway started to fade away. A new generation of Americans were born, one which had grown up with paved roads and a numbered highway system. Most Baby Boomers, and even more of their children, have never heard of the Lincoln Highway. However, not everyone has forgotten. 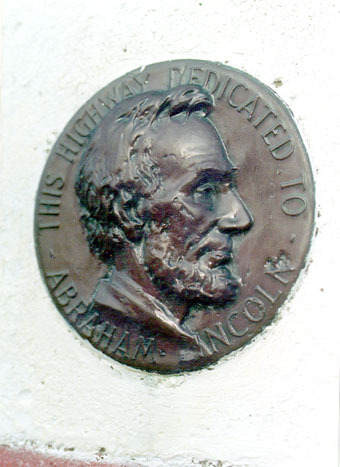 The Lincoln Highway Association was reactivated in 1992, dedicated to preserving the highway. With the help of the association, the Lincoln Highway will always stay alive.